This post may contain affiliate links. Please read my full disclosure here. 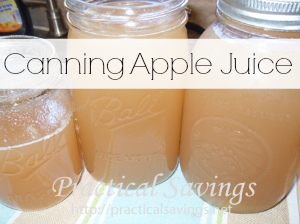 Welcome to the 52 Week Money Savings Challenge Week 22! 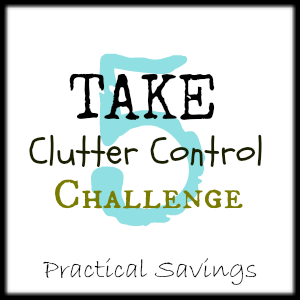 I’m so excited you’re here and joining me on this challenge! Last week I talked about some of things I learned when we refinanced our home. 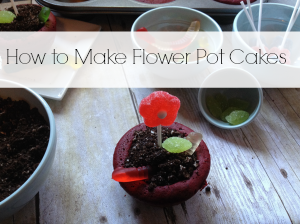 This week, we’re going to chat about growing your own food. This past spring we had an interesting development in our mulch bin. We had seedlings sprouting up left and right. At first, I wasn’t going to worry about them (I’d probably kill them anyway). But they grew and grew and grew. We soon discovered we had a few tomatoes popping up, potatoes had sprouted and some squash. Time to come up with a plan. 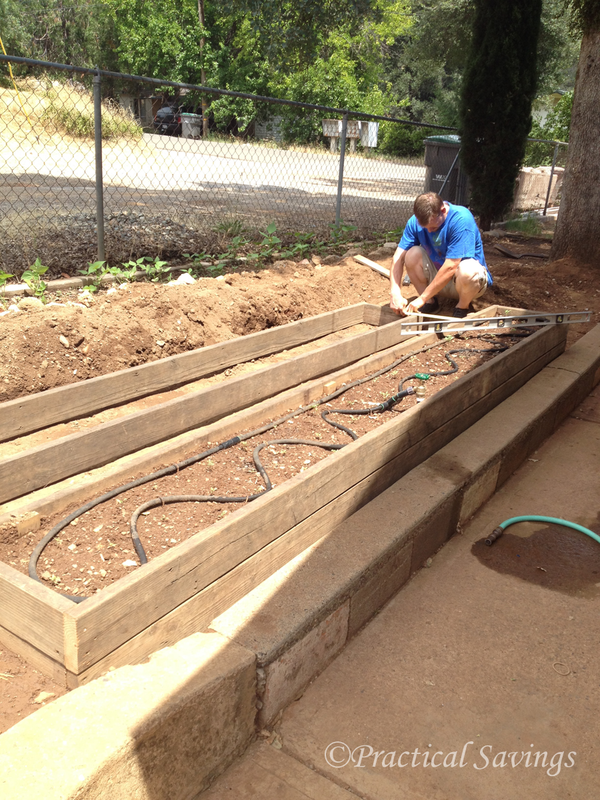 My husband helped me build some more raised beds from wood we had laying around (my goal is to only grow in raised beds from now on), I bought a few more tomato plans, some bean plants and planted some seeds I had (very late I might add). We have been enjoying the fruits of our labors this year and surprise! I didn’t kill anything. 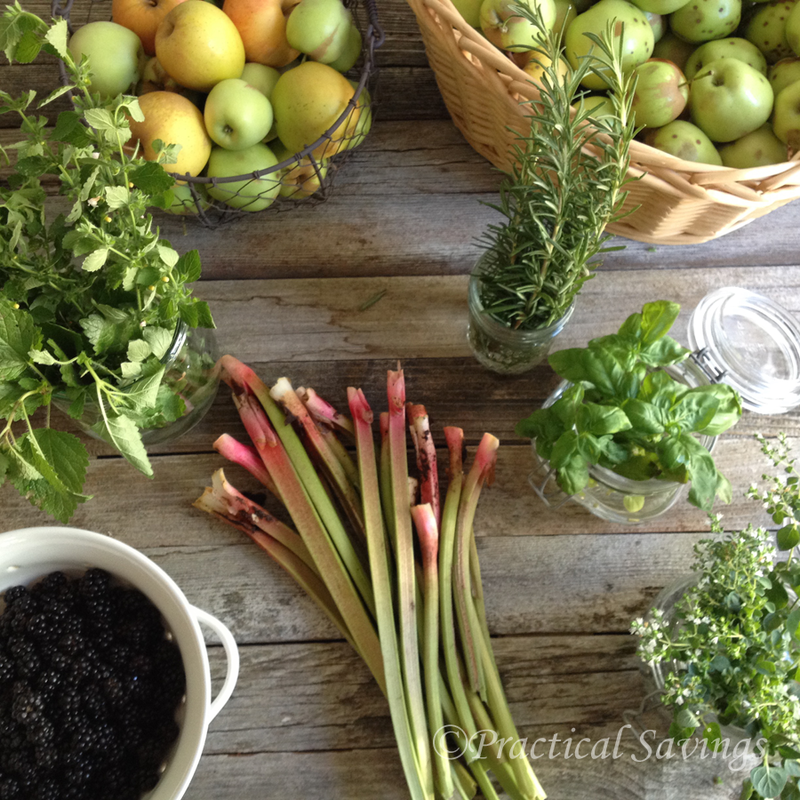 Our harvest this year included some herbs, blackberries, rhubarb (one of the few plants I’ve managed not to kill over the years), apples, carrots, tomatoes, beans (two kinds), butternut squash and potatoes. While they weren’t enough to keep me from having to buy some produce at the store during the summer, they definitely reduced my grocery budget a little and we were able to enjoy eating the food we grew. We have also been able to share some with friends and neighbors. If you’re going to start a garden, there are some things to consider like time of year, climate, water prices, your set-up and if you need to purchase seeds or plants. This year might not be the year you start a garden, but it might be the year you start planning one. Look around your property and watch the amount of sun each section gets or if you live in an apartment and have a patio, start planning a container garden. Start doing some research into what grows well in your area. I’m so glad to have you on this journey with me. I’m looking forward to each week and I hope these posts and the emails are not only helpful to you, but encouraging as well. 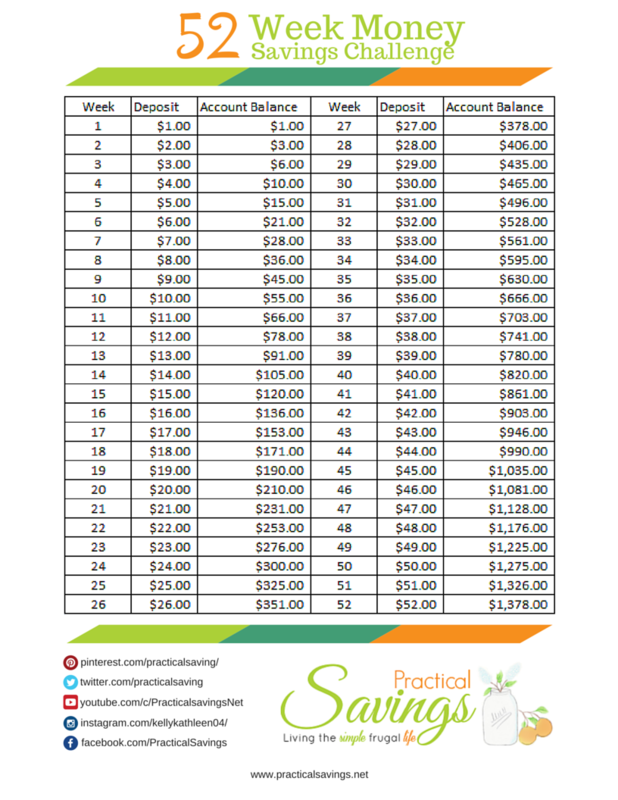 If you are new and just now joining, subscribe to the weekly email and download your own copy of the 52 Week Money Savings Challenge printable. All current subscribers are entered into an Amazon drawing held at the end of the month. 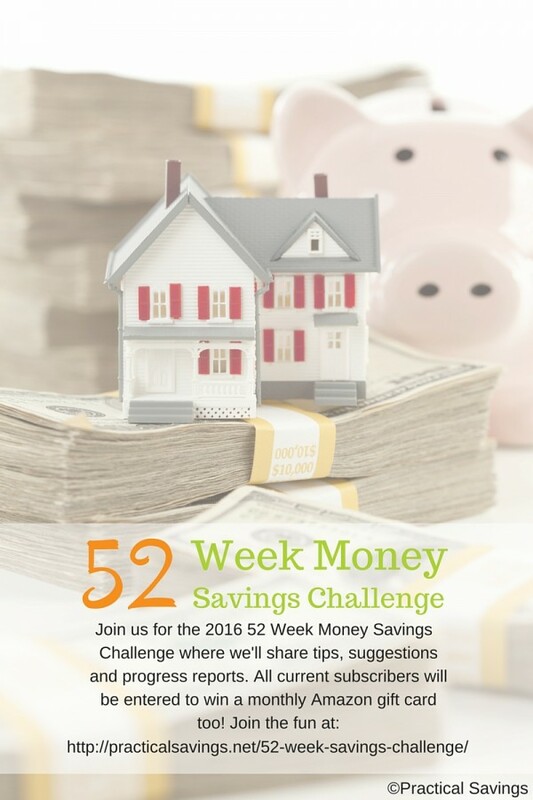 If you want to catch up on the reading of each week, go to our 52 Week Money Savings Challenge page and check out each week listed, as you’re able. Don’t worry about catching up on savings amounts unless you’re able to, just start with the current week and add extra if/as you’re able. Before we wrap up this week, I want to hear from you! 1) What are you most excited about in participating in this challenge? 2) What are your concerns or frustrations about setting money aside? Kelly is a wife, second generation homeschooling mama to 5, and a lover of coffee, old books, and cooking. 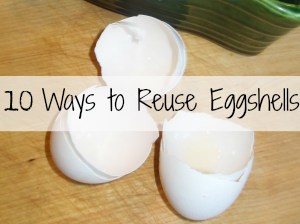 Kelly writes about life, frugal living and food on Practical Savings and sometimes, her sarcastic side comes out.